BOSTON--(BUSINESS WIRE)--Aug. 2, 2016-- Staples, Inc. (NASDAQ:SPLS) offers school essentials with prices as low as 17 cents on the Less List for School. The Staples Less List for School features season-long low prices on back-to-school essentials to offer customers even more savings. 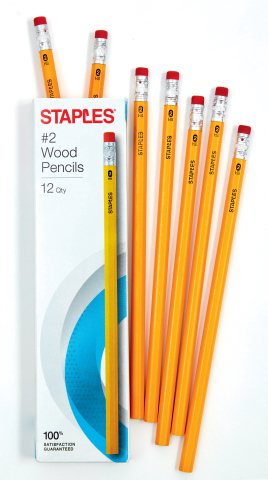 One Subject Notebooks (17¢, in-store only), Crayola Classic Markers, 10 pack (97¢, in-store only), Two Pocket Paper Folders (17¢), in-store only), Staples Yellow #2 Pencils, 12 pack (75¢), Staples Clear Gluesticks, 4 pack ($1) and Bic Round Stic Ballpoint Pens, 12 pack ($1) are just some of the low prices customers will find on the Less List for School (www.staples.com/lesslist). In addition to the Less List for School, Staples offers Weekly School Steals, savings through Staples Rewards and low prices all season long, backed by the Staples 110% Lowest Price Guarantee. Less List for School pricing valid through the back-to-school season.